Embody what it means to be Darth Vader with this child mask and cape. The black durable plastic ½ mask has injection molding to replicate the true Vader look and features slotted grill holes for easy breathing. The black cape is made of polyester and measures at 38” from shoulder to bottom. Plus, a button closes the cape around the neck. 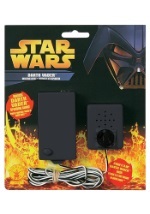 Delve into the Dark Side with this officially licensed kit and our other Vader costume accessories.